The Brewers “floated” an extension offer to infielder Jonathan Villar, says Heyman, but he wasn’t interested. The club’s initial offer, at least, would only have guaranteed him around $20MM. While Villar had a relatively undistinguished career before landing in Milwaukee, he was rather excellent last year and hasn’t yet turned 26. On the other hand, he won’t reach arbitration eligibility until next fall and still has to prove he can repeat that effort. Though Milwaukee owner Mark Attanasio may have been willing to green-light pursuit of Matt Wieters, it seems that the front office wasn’t enthusiastic about that possibility. While the Rangers haven’t yet opened extension talks with catcher Jonathan Lucroy, it’s still expected that a deal will at least be explored. GM Jon Daniels has acknowledged as much, though it’s unclear just when the discussions will get underway. If nothing comes together, Lucroy promises to be one of the game’s most widely pursued free agents next winter. Texas, of course, is also chatting with starter Yu Darvish and second baseman Rougned Odor. The Dodgers explored a deal with the Tigers involving star righty Justin Verlander, per Heyman, who notes that “nothing got close.” Verlander’s hefty salary obligations were considered a barrier, though it seems his no-trade protection may not have been. The veteran righty has suggested he’d be amenable to consider a swap, and his relationship with Kate Upton would likely make Los Angeles an appealing destination. While the Dodgers have a quite a few starters on hand, it’ll be interesting to see whether the pursuit of the resurgent Verlander is rejoined at some point. Speaking of the Tigers, the organization evidently considered quite a few other deals before largely holding pat. The Mets “seriously discussed” giving up Michael Conforto for the final season of control over star slugger J.D. Martinez, but ultimately backed down. While the Astros reportedly checked in on Miguel Cabrera, they were asking for “more than half of the $150 million remaining on Cabrera’s contract” to be paid by Detroit and apparently never offered enough for the front office to bring a deal to ownership. And both the Twins and Padres made inquiries on shortstop Jose Iglesias, but clearly nothing developed with either team. Though the Indians had real interest in Chase Utley, the team’s offer was shy of the ultimately successful bid from the Dodgers. Still, it seems that Cleveland very nearly landed him before L.A. “stepped in late,” per Heyman. While the Reds have said they are done adding to their MLB roster, Heyman suggests the organization could make a play for some of the veteran pitchers still available. Cincinnati may even have outbid the Padres for Jered Weaver, who earned $3MM, though it’s not clear whether the club ever did so. Veteran righty Tim Lincecum is drawing some interest as he prepares for a showcase, according to Heyman, though surely he won’t draw as much intrigue as he did last year. It’s unclear what’s next for catcher Steve Clevenger, who has attempted to rehabilitate his image in an interview with Jeff Passan of Yahoo Sports. His former team, the Orioles, at least considered offering him a minor-league pact, but ultimately decided against it. The Orioles declined the team’s previously unknown option over righty Logan Ondrusek, as BaltimoreBaseball.com’s Dan Connolly was among those to tweet. Ondrusek had signed with the Orioles out of Japan in the middle of the 2016 season, but was outrighted in late August after a brief stint. It was essentially a formality at this point for the team to decline the option (which was for an unknown amount). Baltimore had hoped that adding Ondrusek would represent a creative way to bolster their relief corps in the middle of the season, and brought him back stateside after he continued to produce good results for the NPB’s Yakult Swallows. The Reds announced that utilityman Ivan De Jesus has been outrighted off of the 40-man roster. He has been a fairly significant part of the major league team over the last two years, playing in 180 total games. But his batting output dwindled in 2016: despite a slightly higher batting average and identical .311 OBP in comparison to his 2015 line, De Jesus slugged only .312 in his 243 plate appearances. Two recently outrighted Mariners — lefty Charlie Furbush and catcher Steve Clevenger — have both elected free agency rather than accepting a minor league assignment, per MLB.com’s Greg Johns. The team is still waiting to learn what righty Ryan Cook will do; he, too, was recently cut from the 40-man. Lefty Ricky Romero will remain with the Giants on a minor league deal, according to Matt Eddy of Baseball America (via Twitter). Soon to tun 32, Romero is now well removed from his days as an effective major league starter. He only appeared in two games in 2016, both at the Triple-A level, and has thrown just 53 2/3 total innings professionally since 2013 — the last season in which he reached the big leagues. The Yankees selected the contracts of catcher Kyle Higashioka and right-hander Domingo German, adding them to thee 40-man roster in advance of the Rule 5 draft. Though he’s already 26, and has been Rule 5-eligible before, Higashioka is coming off of his most promising season as a professional. Over 416 plate appearances at Double-A and Triple-A, he slashed .276/.337/.511 with 21 home runs. Meanwhile, the 24-year-old German pitched last year at the Class A and High-A level after missing all of 2015 due to Tommy John surgery. He ended up starting ten games and posting a 3.81 ERA over 49 2/3 innings, with 6.9 K/9 against 2.0 BB/9, but will look to get fully back on his promising track next year. The Tigers announced that they have selected the contracts of right-hander Myles Jaye and left-hander Chad Bell from Triple-A Toledo. The 24-year-old Jaye split the 2016 season between Detroit’s Double-A and Triple-A affiliates, working to a combined 3.95 ERA with 7.5 K/9, 2.3 BB/9 and a 53.3 percent ground-ball rate in 161 2/3 innings (28 starts). MLB.com ranks Jaye as Detroit’s No. 26 prospect, writing that he has a 91-93 mph and a solid three-pitch mix but also noting that he lacks an out pitch. Their report pegs his ceiling as a fourth or fifth starter and says he’s not far from Major League readiness. Meanwhile, the 27-year-old Bell posted a 3.29 ERA with 8.1 K/9, 3.9 BB/9 and a 52 percent ground-ball rate in 98 1/3 innings at Triple-A between the Rangers and Tigers organizations. Detroit picked him up from Texas in the May trade that sent catcher Bobby Wilson to the Rangers. Bell worked more as a reliever than a starter and held opposing lefties to a .605 OPS, including a .286 slugging percentage. He’ll join Kyle Ryan, Blaine Hardy and Joe Mantiply as options to serve as a second lefty behind Justin Wilson in Detroit’s bullpen next year. The Braves have signed righty Danny Reynolds to a minor league deal, tweets MLBTR’s Zach Links. Reynolds struggled with Double-A Arkansas in the Angels’ system in 2016, with a 5.61 ERA, 8.3 K/9 and 6.4 BB/9 over 33 2/3 innings. The 25-year-old was released in June and wound up in independent ball. Most reports offer praise for his velocity, however, and his stuff was interesting enough that he went from the Angels to the Dodgers to the Astros and back to the Angels in a four-month series of waiver claims starting last December, so the Braves might hope he provides a bit of upside than the typical organizational player. Mariners catcher Steve Clevenger has elected to become a free agent, SB Nation’s Chris Cotillo tweets. The M’s announced yesterday that they had outrighted Clevenger. The 30-year-old hit .221/.303/.309 while playing sparingly in the big leagues last season. He missed time to an elbow injury, then was suspended by the team following a pair of offensive tweets. The Rangers have announced that they’ve selected the contract of IF/OF Drew Robinson, preventing him from becoming a minor league free agent. The 24-year-old had a solid season with Triple-A Round Rock in 2016, batting .257/.350/.480 with 20 home runs in 539 plate appearances. Robinson has struck out in more than a quarter of his career minor league plate appearances and typically doesn’t hit for good averages, but his walk-heavy offensive game has been resilient as he’s moved through the Rangers’ system, and his ability to play six positions (first, second, third and all three outfield spots) could help make him useful at the big-league level. The Mariners announced on Wednesday that they’ve claimed right-hander Ryan Weber off waivers from the Braves and designated catcher Steven Baron for assignment. Additionally, the team has outrighted catcher Steve Clevenger, left-hander Charlie Furbush and right-hander Ryan Cook off the 40-man roster. Beyond that, the Mariners also announced that righty Adrian Sampson has been lost on waivers to the Rangers (who made their own announcement of the move shortly before Seattle’s press release was issued). Weber, 26, is the lone addition to the Mariners’ roster and will join the organization on the heels of a 2016 campaign that saw him post a 5.45 ERA in 16 appearances (two starts) with the Braves. Weber totaled 36 1/3 innings and averaged 5.7 K/9 against 1.2 BB/9 to go along with very solid 50.8 percent ground-ball rate. His work in Triple-A Gwinnett was considerably more impressive, as he posted a 2.76 ERA with 6.0 K/9 against 2.0 BB/9 in 62 innings there. Weber will give Seattle a depth piece for both the rotation and the bullpen and comes with a minor league option remaining, so there’s no need for him to break camp with the team next spring in order to remain in the organization (assuming he’s not trimmed off the 40-man roster later this winter). Furbush, 30, is the most notable subtraction from the roster. He’s been a key cog in the Seattle bullpen since 2012 but missed the entire 2016 season due to shoulder troubles that ultimately resulted in surgery to repair a partial tear of his left rotator cuff in August. He’d likely have made the same $1.6MM that he made in 2016 if he remained on the roster and went through arbitration, so his outright, while noteworthy, isn’t much of a surprise, either. From 2012-15, Furbush logged a 3.23 ERA with 10.3 K/9 against 3.0 BB/9 in 175 1/3 innings with Seattle. Clevenger, meanwhile, is another unsurprising roster cut. Acquired in the much-maligned swap that sent Mark Trumbo to the Orioles this past offseason, he batted .221/.303/.309 in just 76 plate appearances and missed time with injury before ending his season on a team-issued suspension following some offensive tweets. While Mariners fans rightly cringe at the trade in retrospect, the deal was largely regarded as a salary dump at the time, and trade interest in Trumbo around the league was tepid, at best (hence the limited return). As for Cook, the former Athletics standout has seen his career stall in recent years due largely to injuries, and 2016 brought more of the same. The Mariners announced in their press release that the 29-year-old had Tommy John surgery on Oct. 20, so he figures to be out for the entire 2017 season as well after only pitching a single inning with Seattle’s Rookie ball affiliate in 2016. Cook notched a 2.60 ERA and averaged better than a strikeout per inning in 190 1/3 frames over the first three seasons of his career in Oakland, but injuries have limited him to just 8 2/3 innings in the Majors since that time. Baron, 25, was the 33rd overall pick in the 2009 draft but clearly hasn’t lived up to that draft billing. He’s gone hitless in his only 11 Major League plate appearances and has received very limited time in Triple-A, slashing .277/.316/.391 in 197 plate appearances. Overall, he’s a .234/.291/.341 hitter in 544 minor league games. The Mariners announced that catcher Steve Clevenger has been suspended without pay for the remainder of the season. Clevenger was the subject of a great deal of social media controversy yesterday following a pair of offensive, racially charged tweets. Clevenger, 30, was acquired in a lopsided offseason swap that sent Mark Trumbo to the Orioles in what amounted to a salary dump for the Mariners. Clevenger has been on the disabled list since late June to do a fractured hand and has appeared in just 22 games for the Mariners this year, batting .221/.303/.309 in 76 plate appearances. The former Cubs and Orioles backstop is a lifetime .227/.284/.324 hitter in 522 Major League plate appearances. The suspension will cost him about $28,000 — not an insignificant sum for a player that has yet to reach arbitration in his career — and it seems likely that it’s only a matter of time before the Mariners cut ties with him completely. Mariners manager Scott Servais doesn’t mind having extra players on his roster, but the way teams are allowed to use their call-ups following September roster expansion bothers him, Matt Pentz of the Seattle Times writes. With more tactical options available, managers can slow the pace of games by making large numbers of substitutions. “I just think you should determine your 25-man roster before the game starts and play the game,” says Servais. “The game just changes in September, and it shouldn’t change. You play a certain way for five months and the last month, you play differently and it’s just not right.” M’s utilityman Shawn O’Malley disagrees, saying that everyday players can use the extra bit of rest reinforcements can provide. “Maybe it does take a little bit longer, but at the end of the day, what’s 20 minutes?” he says. “Any time you can give guys that are playing 159 games a year a five-inning break, it benefits them.” Here’s more from Seattle. The Mariners have announced that reliever Tom Wilhelmsen has been activated from the 15-day DL. The righty has missed the past two weeks due to low back spasms. For the season, Wilhelmsen has posted a 7.02 ERA, 5.7 K/9 and 3.2 BB/9 over 41 innings, but his performance has been much closer to his career norms since he returned to the Mariners organization in June after struggling in the early going with the Rangers. In other Mariners injury news, catcher Steve Clevenger’s season is over after the organization opted to end his rehab assignment at Double-A Jackson, Ryan Divish of the Times writes. Clevenger has experienced lingering elbow soreness. The Mariners placed him on the DL in late June with a separate injury, a hand fracture for which he had surgery. The 30-year-old Clevenger collected just 76 plate appearances in his first season in Seattle, batting .221/.303/.309 with one home run. That’s a stark contrast from the performance of Orioles slugger Mark Trumbo, for whom Seattle acquired Clevenger in a salary-shedding move. Clevenger will be eligible for arbitration after the season. With Chris Iannetta having a $4.25MM club option, the Mariners will have some decisions as they attempt to determine who, besides the hot-hitting Mike Zunino, will catch for them next season. TODAY: Zunino will get the call, GM Jerry Dipoto tells Jim Duquette of MLB Network Radio (Twitter link). He’ll be looking to make good on his top-quality prospect pedigree and big-time power. YESTERDAY: Mariners catcher Steve Clevenger has been diagnosed with a break to the third metacarpal in his right hand, as MLB.com’s Greg Johns was among those to tweet. He was struck by a foul ball behind the dish in tonight’s game. Clevenger, 30, was acquired over the winter in exchange for Mark Trumbo. He hasn’t quite produced at the rate of the slugger he was dealt for, but he’s a useful receiver — particularly since he hits from the left side. Over 76 plate appearances on the year, he owns a sub-optimal .221/.303/.309 slash while serving as a backup for Chris Iannetta. Seattle does have multiple options in the organization. Former regular Mike Zunino, who is still just 25, has been quite productive at Triple-A, with a .282/.366/.516 batting line and 15 long balls in 287 trips to the plate. If the club decides it isn’t quite ready to give Zunino its next shot, it could look to either Steve Baron or Rob Brantly. The former — who like Zunino is 25 years of age and resides on the 40-man roster — is currently playing at Double-A. Brantly has a fair bit of MLB experience, though he too is a younger option. But he’d require a 40-man spot. 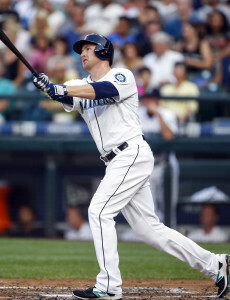 On Wednesday, Jerry Dipoto traded slugger Mark Trumbo for the second time. As the GM of the Angels, Dipoto jettisoned Trumbo in December 2013, soon after signing superstar first baseman Albert Pujols. After dealing Trumbo roughly two months after taking over in Seattle, Dipoto wants it known that it’s nothing personal with Trumbo, just business. As many outsiders picked up on, Dipoto indicated that Trumbo was moved in large part because of his projected $9.1MM salary for 2016. Unlike the last Trumbo trade, Dipoto isn’t moving Trumbo in order to eliminate redundancy in the lineup, and Dipoto himself isn’t sure how the first base position will be filled. Still, I asked the GM whether he would be more likely to fill that spot via free agency or trade. “It’s tough to say. There’s still a lot of time between now and Opening Day. We’ve discussed a lot of trade candidates with various teams around the league and we’ve at least surveyed the free agent pool, but have not engaged [any available first basemen] at this point,” Dipoto said. Of course, this year’s free agent crop includes Chris Davis, the man that Trumbo might wind up replacing in Baltimore. Dipoto’s comment would indicate that the Mariners have not reached out to Davis, though — as MLBTR’s Steve Adams noted this week — he may not be a logical match for Seattle anyway. Dipoto has made it known that he prefers the trade market to free agency and, as he revealed, that has been the only avenue explored thus far for first basemen. Seattle would also have to sacrifice the No. 11 overall pick to sign Davis, a player who could command a six-year, $144MM deal in the estimation of MLBTR’s Tim Dierkes. Meanwhile, Dipoto seemed genuinely excited about the addition of catcher Steve Clevenger as a complementary piece that can fit in as a catcher, first baseman, or a designated hitter. Dipoto stopped short of guaranteeing anything for the out-of-options player, but it sounds like he has a role in mind for him. Clevenger’s versatility coupled with the signing of catcher Chris Iannetta also gives Seattle options when it comes to Mike Zunino. Seattle can now afford to let Zunino start the year in Triple-A Tacoma, but they could also carry all three players with Clevenger seeing time at first base. Still, Dipoto’s plan and preference is to have Zunino begin the year in Triple-A for additional seasoning. The Orioles don’t yet know whether Chris Davis will return to Baltimore, but they have a potential replacement on the roster now in the event that he signs elsewhere, as the team has announced the acquisition of Mark Trumbo and left-hander C.J. Riefenhauser from the Mariners in exchange for catcher Steve Clevenger. Trumbo, 30 in January, provides insurance in the event that Davis does not return and can be an option in left field or at DH in the event that Davis is re-signed. Alternatively, the Orioles could deploy Trumbo at first base for his final season of club control and use Davis primarily in the corner outfield in 2016 before shifting him back to first base when Trumbo reaches free agency next winter. Trumbo averaged 32 homers per season from 2011-13 with the Angels and D-backs, but injuries slowed him in 2014, and his power output declined a bit in 2015. In total, he’s a career .250/.300/.458 hitter with 30-homer power that is coming off a .262/.319/.449 season split between Arizona and Seattle. This marks the second time in the past three years that Mariners GM Jerry Dipoto has traded Trumbo, as he sent him to Arizona in a three-team deal that netted Tyler Skaggs and Hector Santiago while serving as GM of the Angels. From a defensive standpoint, Trumbo is limited. While he has experience at third base, in the corner outfield and at first base, he’s below average at the hot corner and in the outfield. While that limitation and his low on-base numbers suppress Trumbo’s value, he’s still a legitimate source of right-handed power that can handle first base. The Mariners don’t value that skill set at Trumbo’s projected $9.1MM salary, but he can certainly help the Orioles next season, and a move out of Safeco Field could benefit his overall production. Riefenhauser, a 25-year-old southpaw, was acquired earlier in the winter in the trade that also delivered Nate Karns from the Rays, but will apparently never suit up for Seattle. Riefenhauser has yet to do much of use in the big leagues (6.30 ERA in 20 innings), but has put up excellent minor league numbers. In 113 innings at the Triple-A level, Riefenhauser has a 2.15 ERA to go along with averages of 8.7 strikeouts and 3.2 walks per nine innings pitched. The 29-year-old Clevenger gives the Mariners a left-handed-hitting complement to Chris Iannetta and makes it easier for the club to give Mike Zunino some further development time at Triple-A. Clevenger, who also has experience at first base and third base, batted .287/.314/.426 with a pair of homers in 105 plate appearances in Baltimore last season. He’s been shuffled between the Majors and minors with the Cubs and Orioles over the past four seasons due primarily to questions about his defense, as he doesn’t have much to prove at the plate in Triple-A. The former seventh-round pick has never shown a great deal of power but consistently hits for average and gets on base at the top minor league level, where he’s a lifetime .310/.372/.413 hitter in 1061 plate appearances. Clevenger is out of minor league options, so he’ll need to stick with the Major League club out of Spring Training in 2016. While he was projected to split time with Caleb Joseph behind the plate for the Orioles in 2016, a wrench was thrown into those plans when Matt Wieters accepted a qualifying offer. With Wieters and Joseph now slated to be the primary catching duo next season, Clevenger’s role with the team is uncertain. The trade leaves the Mariners without a definitive answer at first base in 2016. With Trumbo now in Baltimore and Logan Morrison having been dealt to Tampa Bay in the aforementioned Riefenhauser trade, Seattle will likely look outside the organization to bring in a new first baseman. While some might speculate on the possibility of Davis — the man that could theoretically be replaced in Baltimore by Trumbo — Dipoto has operated primarily on the trade market to make his biggest additions thus far and has voiced a preference for that route to free agency. Considering the fact that Seattle has the top unprotected draft pick in 2016 (No. 11 overall), adding Davis would be more costly for the Mariners than any other club. None of that, of course, precludes a run at Davis, but it’s hard to envision him as the team’s top priority. Bob Dutton of the Tacoma News Tribune first reported that a Trumbo-for-Clevenger swap was close. Jon Heyman of CBS Sports said an agreement was in place (Twitter link). Dutton and MLB.com’s Greg Johns said a second player was in the deal (Twitter links). Dan Connolly of the Baltimore Sun tweeted that Riefenhauser was the second player.